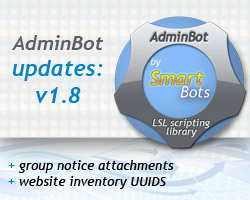 SmartBots AdminBot library has been updated to version 1.8 and now supports group notices with attachments. The notice delivery is being performed as before (by using SB_NOTICE_SEND command) but can be accompanied by intentory UUID parameter. The inventory UUID is an unique identifier of inventory item of the bot. You can obtain this UUID by opening bot’s inventory page in your account, see this page for screenshots. The full history of AdminBot is available here, the most recent version is available at SL Marketplace. P.S. We’ve also updated the logo of AdminBot – you can see it on this page and at SL Marketplace page.